This volume is a collection of short stories. 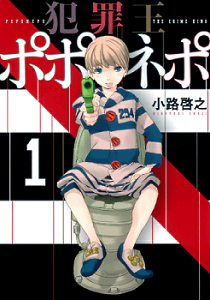 The title story "Aka no Sekai" features a boys' summer camp out in the country. 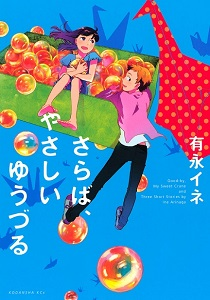 The main character, Regulus, is reluctantly attending the summer camp, where he shares a room with a cheerful boy named Miran. 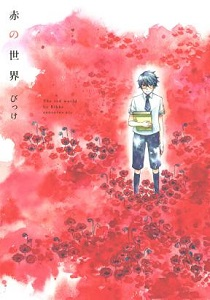 Soon after arrival, though, some of the other boys begin acting strange, while claiming they want to see the color red. Will Regulus and Miran be able to figure out what is happening before it is too late? 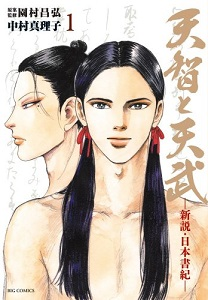 The Himekuri Hime group consists of three members: Matsuzaka Tomoko with her enormous breasts, Chisa the young one, and Yukibe the girl next door. With their manager (who is dating Matsuzaka Tomoko), they strive to become the best idol group in Japan! The one feared by all, "Criminal King Poponepo," has been arrested, but he immediately escapes prison. During his escape, he abducts the main character, Maruki, and implants the IC chip that identifies Poponepo as a criminal into Maruki. Now, Maruki is being arrested as the new "Criminal King." Will Maruki be able to live up to the notoriety of the Criminal King? It is an age when large-scale natural disasters frequently happen all over the world. It is a time when cyborgs and autonomous robots are beginning to appear on the market in technologically advanced nations. Major world powers compete for technology and resources. The divide between rich and poor grows and the future for the poor looks bleak. In this transitional stage, everyone wanders around in a self-indulgent daze and the way out isn't clear... This is the story of how two cybernetically enhanced girls meet in such an era. Koukaku no Pandora is the new action packed manga series by Koshi Rikudo, based on an original story by Masamune Shirow. Yoshida is taking a college class on Japanese culture, and he's the only student. When he arrives, he finds that the course is taught by an enthusiastic young professor named Manaka. She is fascinated by modern Japanese culture, and this first volume features her lectures about many properties of the otaku and otaku society. This volume contains four short stories by Ine Arinaga. In the first story, two friends can see strange creatures every Thursday. These creatures climb onto people, stating their troubles in simple terms. Though they worry about the people around them, there is little they can do to help. Other stories involve situations including a girl who wishes away a boy's face and a box that contains what the person who owns it truly wants. 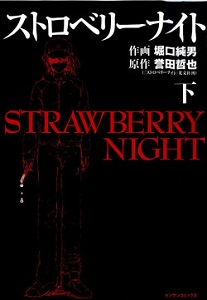 There exists a rumor that an online show only known as "Strawberry Night" showcases a murder show in front of a live audience. When dead bodies were found in lakes around the city, the city police began a full investigation on this online forum. Investigator Himegawa leads her team in searching for the hosts of this deadly "show," but the answers they find may be beyond their imagination. 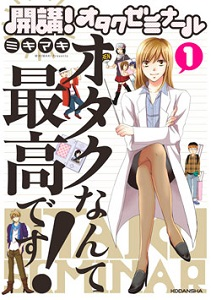 If you haven't done so already, check out the scanlations of the mangas from previous shout outs which have been recently scanlated: school life comedy Sweet Magic Syndrome (MH link), romantic mystery Mou Ii Yo (MH link).